The Black Belt represents a symbol of excellence. When we train you, we use the symbol of a Black Belt to help you strive to be better. 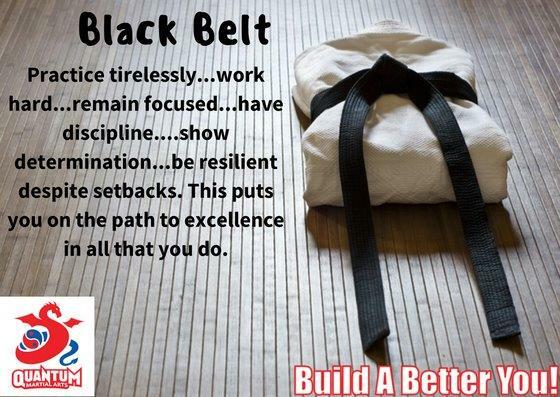 A Black Belt is simply a white belt who never gave up and worked hard at achieving their goals. However, we do not just want you to be Black Belts in the dojo, but also Black Belts at life. Be the best person you can be. You will not be perfect, but try your best to be. At the end of the day, Black Belt is not about the colour of the belt, but more the mindset. If you have the right mindset…or attitude…you can achieve anything in life. And that is we want for you and your child.